Obama’s U.S.-China climate agreement: Carbon budget and exponential curves show why this is a fair deal. 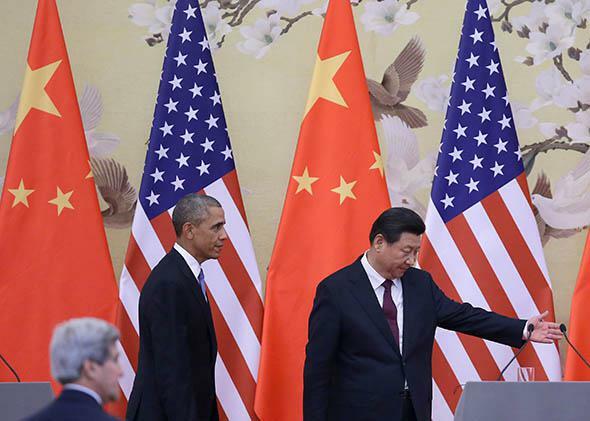 To appreciate the U.S.-China climate agreement, there’s only one number you need to pay attention to. Chinese President Xi Jinping and President Obama walk onstage before announcing a climate deal at the Great Hall of People on Nov. 12, 2014, in Beijing. The big climate news of last week, indeed maybe of the past several years, was the surprise announcement of a bilateral U.S.-China agreement setting targets for CO2 emissions out to the year 2030. Is this really such a big deal, or are climate protection advocates just grasping for any good news to offset the grim implications of a Republican takeover of the U.S. Senate? The answer is: Yes, it is a very big deal, at least if both parties fulfill their commitments. Today, I will be an optimist and assume that somehow they pull it off. There are no obvious technical barriers but considerable political ones. Some parties are already rumbling that the United States is giving away the store for nothing much in return. We’ll see, however, that if anything it is China that is getting the short end of the stick—and a good thing, too, because the climate cares about CO2, not fairness, and if we are to have any hope of keeping warming from much exceeding 2 degrees Celsius, China will need to do more than its fair share. The United States, European Union, and China together produce more than half of the world’s annual CO2 emissions, and with the new agreement, all three have made a public undertaking limiting future emissions. (Europe has been doing its part for decades, having made its first binding commitments at the time of the Kyoto Protocol.) That by itself makes the deal a big deal, but we need to look at the nature of the commitment to see whether it is big enough to significantly improve our chances of keeping global warming below 2 C, which has been adopted as a general guideline for avoiding extremely dangerous climate change. This guideline does not mean that climate change is harmless below 2 C, or that it suddenly becomes so catastrophic above 2 C that further efforts at limiting warming are pointless, but like a highway speed limit, it serves as a useful benchmark for where you start to worry about things being really bad. By what yardstick should the “bigness” of the deal be measured? This brings us to the concept of carbon budgets. The excess CO2 we put into the atmosphere by burning fossil fuels such as coal, oil, or natural gas is removed very slowly by ocean uptake and other geological processes. As a result, a significant portion of the CO2 we emit each year will still be in the atmosphere 10,000 years from now. As long as human activities are transferring long-buried carbon into the atmosphere in the form of CO2, the atmospheric CO2 levels will continue to rise, and they will drive ever-greater warming. CO2 accumulates in the atmosphere like mercury accumulates in the fat of a fish swimming in polluted waters. The impact of fossil-fuel burning (and deforestation) on climate depends not just on the current year’s emission but on the cumulative emissions of CO2 over all past times. The cumulative CO2 emissions are typically quoted in terms of the amount of carbon in the CO2 (which contains 27 percent carbon by weight), measured in gigatons, or billions of metric tons. (A metric ton is 1,000 kilograms, or just a bit more than an English ton.) In thinking about the human imprint on future climate, the cumulative carbon is the only number you really need to pay attention to. It turns out that 1,000 gigatons of carbon—1 trillion tons—is roughly what it takes to warm the globe by 2 C. If we release that much carbon into the atmosphere in the form of CO2, the warming will stick around for at least 1,000 years before the globe begins to recover, even if we go cold-turkey on fossil fuels when we release our first trillion. Since the beginning of the industrial revolution, we have gotten about halfway there. It took several hundred years to emit our first half-trillion tons, but worldwide CO2 emissions are growing exponentially at a compound rate of about 2.8 percent per year (since 1950) and so it will only take another 25 years at the current rate of growth to hit a trillion tons, at which point it’s game over for the 2-degree target (though of course not too late to try to keep warming under 3 degrees). We need to eventually get CO2 emissions down to zero, but in the meantime it’s the exponential growth that’s our main enemy, since that boxes us in and leaves little time for decarbonizing the economy. The first order of business is to get off the exponential curve, otherwise we are doomed to be on the Impossible Hamster track. It is against this goal that the U.S.-China agreement should be measured. U.S. emissions have not grown since 2005, and indeed have declined moderately despite aggregate gross domestic product growth of more than 14 percent since that time. Part of that decline has been due to substitution of natural gas for coal, and we can continue to play that game for a while longer, but to sustain the decline over a longer time will ultimately require additional measures. Obama’s agreement with China commits the United States to reducing its CO2 emissions to between 26 percent and 28 percent below the 2005 levels by 2025. The EU has committed to a 40 percent reduction below 1990 levels by 2030 and has already gotten halfway there. Accelerating the reduction of both EU and U.S. emissions helps to offset exponential growth elsewhere in the world, and we’ll soon see how that adds up. But what about China? China is currently the black swan on the horizon when it comes to fighting exponential growth. Based on data since 1940, China’s emissions have been growing at a compounded annual rate of more than 7 percent, and at that rate it will not be many more decades before Chinese exponential growth would dominate world emissions, at a time when we need to be reducing the world exponential growth rate below its currently alarming 2.8 percent value. 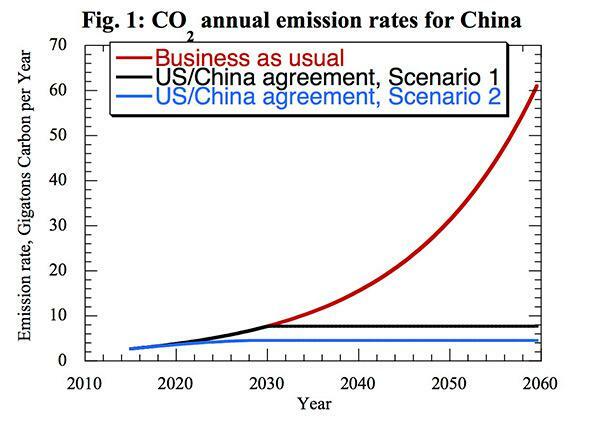 Under the U.S.-China bilateral agreement, the Chinese emission target is phrased very differently from the U.S. target, but with regard to slaying the exponential dragon, it is probably the most important part of the deal. The Chinese commitment is not a commitment to any specific value of emissions but rather a commitment that the country’s emissions will peak by 2030, and thereafter will not increase. The deal does not specify whether and by how much emissions will decrease after 2030, but the significance is that China is committed to get off its exponential emissions track by 2030. Translating this commitment into quantitative implications for cumulative carbon involves a lot of guesswork as to how China will go about fulfilling its commitment, because the agreement does not spell out the value at which emissions will peak. A cynic would say that China could just increase its growth rate to, say, 10 percent and peak at an enormous value in 2030, giving itself plenty of wiggle room to hold emissions constant or decrease them thereafter. If this is really China’s intent, then the new agreement is largely meaningless. But let us suppose instead that China’s commitment was taken in good faith. A minimum good-faith fulfillment would be to continue growing at 7 percent up to 2030 and then hold emissions constant thereafter. This scenario is shown in the middle (black) curve of Figure 1. In terms of cumulative carbon, that would mean that China emits another roughly 70 gigatons out to 2030, and holding emissions constant thereafter, emits a further 86 gigatons between 2030 and 2060. Without the agreement, China’s emissions scenario would look like the upper (red) curve, and China would emit a further 790 gigatons in the latter period, which would be more than enough to bring the world over the trillion-ton limit regardless of what anybody else did. So yes, getting China off the exponential curve is a very, very big deal indeed. But the scenario where Chinese emissions growth continues unabated until 2030 may be pessimistic. If China is serious about peaking in 2030, it is unlikely that it would do nothing to reduce its growth rate and then put in a crash program in 2030 to bring growth to a halt all at once. More likely, the measures would be phased in gradually over the next 15 years, bringing the growth smoothly to zero by 2030. If the growth rate is brought to zero linearly over the next 15 years, the Chinese emission rate curve looks like the lower (blue) curve and would have lower cumulative emissions than the abrupt scenario even if there are no reductions in emission rate beyond 2030. Now let’s add in the contribution of the United States and European Union to cumulative emissions under the stated commitments. 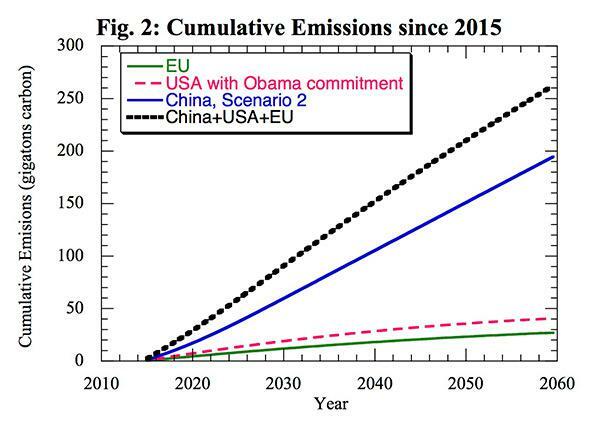 The aggregate cumulative emissions for the U.S., EU, and China are shown in Figure 2, subject to the further (pessimistic) assumption that there are no further reductions in U.S. and EU emissions past 2030. The projection from China is taken from Scenario 2 (a linear decrease in growth rate with emissions leveling off in 2030). From this graph we can see that if the commitments are all fulfilled, then cumulative carbon for the countries involved would be just about held to 250 gigatons even without further reductions in emission rates past 2030, leaving 250 gigatons of cumulative carbon that the rest of the world can emit. In this sense, the new U.S.-China agreement brings the 2 C target within reach, though it will not by itself prevent the trillion-ton threshold from being breached. The figure also makes clear, however, that barring an unforeseen reversion of the U.S. or EU to exponential emissions growth, the future fate of the climate is largely determined by what China does. Although Chinese cumulative emissions will dominate U.S. and EU emissions going forward, this is not because China has used an unfair share of the Earth’s ability to act as a waste dump for CO2. Unless one thinks that a person in China has intrinsically less right to the net allowable carbon emissions than a person in the United States or European Union , the appropriate measure of fairness would have to be based on some kind of cumulative carbon emission per person. I have argued a number of fairness principles based on this idea in this article in the Chicago Journal of International Law. If one takes historical emissions into account, one could argue that an EU or U.S. individual exceeded a fair allocation of carbon emissions long ago, whereas Chinese individuals have not yet come close to using up their fair share (because their high emissions rates began relatively recently and because China is supporting a larger population). However, even if one were to write off the carbon debt from the past and only allocate carbon from 2015 onward, under Obama’s bilateral agreement, China is committing to do something pretty close to its fair share. The future cumulative Chinese emissions of 200 gigatons work out to 146 metric tons per person (based on current population). The U.S. allocation in Figure 2 works out to 125 tons per person, which is only slightly below the Chinese allocation. Making any significant allowance for past emissions would result in a judgment that China is doing far more than its fair share of the job of keeping cumulative emissions below a trillion tons. While the European Union, United States, and China account for just over half of the world’s CO2 emissions, there is still the other half of the world to worry about. The next three big emitters are India, Russia, and Japan, with a total of 14 percent of world emissions among them. Of these three, the only one exhibiting clear exponential growth is India, which is growing at about 5 percent per year and is also the highest current emitter of the three. In the next round of negotiations, it would be highly desirable for India to sign on to an agreement similar to China’s commitment under the U.S.-China bilateral agreement, perhaps with Russia and Japan committing to emission reduction targets somewhere between the EU and U.S. targets. One can hope that something like that might happen at the Conference of the Parties negotiations to be held in Paris in 2015. If the U.S.-China deal is perceived to be real, it could well be just what is needed to break the logjam that stymied negotiations in Copenhagen last time around.